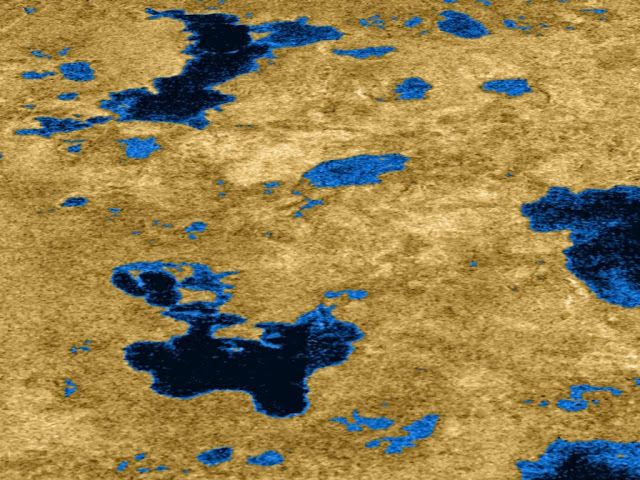 Titan’s lacustrine depressions develop in relatively flat areas. They lie between 300 and 800 meters above the level of the northern seas. They are typically rounded or lobate in shape and some of them seem to be interconnected. Their widths vary from a few tens of kilometes, such as for most of Titan’s lacunae, up to a few hundred kilometres, such as Ontario Lacus or Jingpo Lacus. Their depths have been tentatively estimated to range from a few meters to 100 - 300 meters, with “steep”-sided walls. The liquid-covered depressions would lie 250 meters below the floor of the empty depressions, which could be indicative of the presence of an alkanofer in the sub-surface, analog to terrestrial aquifers, filling or not the depressions depending on their base level. The depressions sometimes possess a raised rim, ranging from a few hundred meters up to 600 meters in height.